Counter Top Brutus 20 two vessel BIAB? The Brutus 20 is a a Full Volume Recirculating System, you could think of it as a two vessel BIAB, specifically built to be as kitchen friendly as possible. 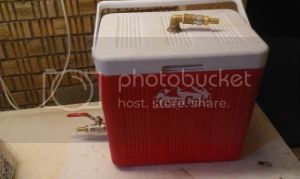 The number of hose changes (connect/disconnect) is minimized, you don't need to lift a heavy bag dripping scalding liquid!, as an added bonus it packs up neatly and the wort runs clear into the kettle. I don't take credit for this design I copied it, links to the original are at the end of this post I built with what I could get sensibly priced so its all plastic and brass, I treated the brass to reduce the possibility of lead being leached from it. I don’t think I needed to, I grew up in a house with lead piping and I’m still here.. I've pillaged these diagrams from the original. (credit jkarp). To reduce hose swaps the counter flow cooler remains in the flow path all the time but for the most part without the cooling water flowing/attached. If your cooling coil is sufficient wort can be directed to a FV rather than back to the kettle. 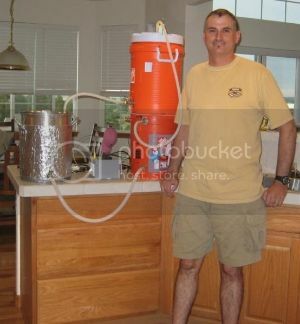 Fill the kettle and recirculate through the mash tun untill strike temperature is reached and stable. Turn off the pump, close the valves and mash in. Open the valves turn on the pump recirculate until clear. Turn off the pump, close the valves. 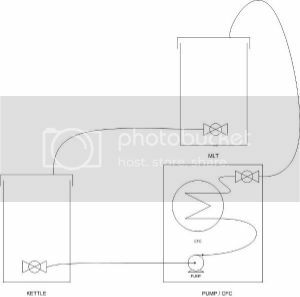 If you want to do a step mash change the temperature in the kettle and recirculate. If you want to you can sparge. Drain to kettle. At the end of the mash period recirculate . Drain into kettle. 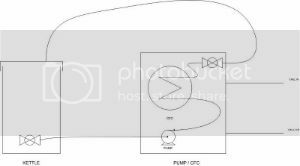 Swap hoses to layout in picture two. 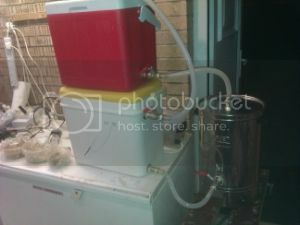 As normal, connect cooling water chill into FV or recirculate into kettle. So far NO MESS and you have not had to lift a steaming scalding bag!!. I made mine from a couple of cool boxes I got from a local Car Boot sale. Tubed up, it's not real I just connected it to take the picture. 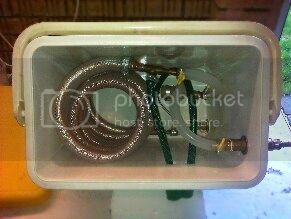 The Mash Tun with inlet and non return valve. The valve was needed for a wort rise and fall cycle that I have not implemented. Utlity Box. 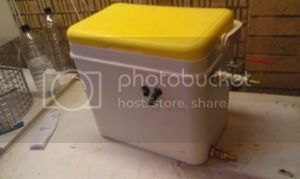 Containing a "solar pump" and a counter flow chiller. and for no good reason a picture of some grain. It's a good working system, efficiency can be good/very good if you don't mind sparging. I made the system small because I don't drink all that much but there is no reason why you could not scale it up. 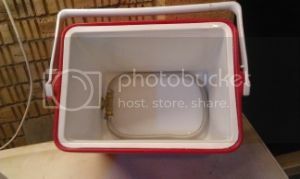 If you do build one I recommend a bucket to replace the utility box as you can get a bigger coil in and raise the mash tun above the level of the kettle so it drains easily. Last edited by aamcle on 17 Jan 2014, 09:02, edited 2 times in total. Pretty impressive system aamcle! At one point I had a system very similar, as did a lot of other members here. We all eventually got tired of the additional space requirements, hardware, costs, cleaning, hose changes, etc. 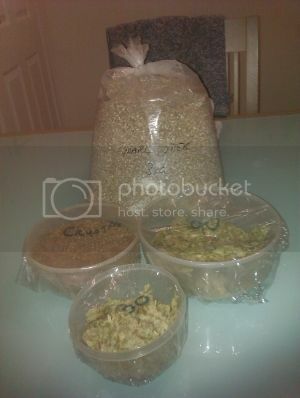 and adopted a simple "one bag & one pot" approach (BIAB). There are an infinite number of ways to make great beer and we each settle upon a method that works best for us. Keep on brewing!